This article was the Collaboration of the week between 17 Apr 2006 and 23 Apr 2006. 12 Horrible experience - first day in Munich! There is a of people who try to live their own way (and grow their own food) with the least possible dependence on the government and outside sources. It's not in Munich directly, but somewhere near (more info welcome). I think they would be open to help any traveler, if one is polite, friendly, humble and maybe helps them on the field or with something else. I think this is not just a place to sleep, but also to get to know many interesting people and gain some understanding of their way of living and the reasons for it. As an experience 'communitarian' then I'm able to add that all our places would be a lot better and easier if they only attracted complete mature and harmonic visitors, however it's impossible to filter well enough...you may even be the next to come!??!?! This is not an tourist attraction, but one of many memorials to the crimes committed in Nazi Germany. Unfortunately, I had to witness international visitors behaving as if it is sort of a Disneyland (posing for pictures on the beds in the barracks etc.). No matter where it is listed, maybe a comment on appropriate behavior would be useful. The "Stay safe" section is pretty vague, isn't it? I read for instance: "Streets are pretty much safe, but with less forewarning than other European cities. If you start to feel uncomfortable, you will be VERY uncomfortable just a few moments later. Though residents are generally tolerant of foreigners, they make it well known when you shouldn't be somewhere. While you may still be safe, you should leave, and quickly. If you go to bars, the scene can change rapidly and (to non-Germans) unpredictably, so caution is advised. Subways run all hours, make sure you know your station between 22:00 and 5:00." What does all this mean? I've been to places known to be pretty much more "unsafe" than Munich and I never met anyone telling me a part of the city is for residents only. Neither have I been to a safe bar or pub with sudden "change of scene" to unsafe. Please consider doing something about this section, or at least describe a bit more so it becomes understandable. Thank you. In the past years, I (a local) met several travellers asking people whether he/she's a "local". Please remember, that using this word for the inhabitants is common when talking about, but calling someone a local lacks any form of political correctness, respect and politeness. On my own travels I only heard questions whether he/she was for example hungarian, american, from Ecuador, from London, from Bangalore, indigenous - but never just local. I don't know why this is mostly forgotten by tourists here, but maybe you could add a section or at least a hint about basic social rules. Thanks a lot. Munich Sea Life Centre[www.sealifeeurope.com/de/munich/] Of the 9 Sea Life Centres in Germany, this is the largest. Costing around 10.5 Million Euro, and covering 2,200sq.m, the centre houses over 30 aquariums, including the 400,000 litre 7m deep 'Sea Life' aquarium - viewable from an underwater tunnel and home to sharks. 11.5 euros. But there is not really a lot of sea life to be seen. Nevertheless the light-work and aquariums are strikingly magnificent and make up for the lack of a good variety in sea-life, which one might expect. In fact, there are just a few sharks and no fish that can’t be found at a much cheaper place. Practically it’s more of a rip off. Horrible experience - first day in Munich! Before we come to Munich, everyone told us the Muechener are very nice people. That's why we decide to come here for our family holiday all the way from Asia. Our first stops were Vienna and Salzburg. We saved Munich as our last stop because it is the destination we most look forward to. We rented an apartment called the Hubmann in Munich South (Fritz-Lange Strasse 6). When we arrived, we were greeted by the owner Frau Hubmann in the most horrible manner. Even though we have already told her we are bringing our 18 months old baby along while we booked through the internet, it was apparent that she has absolutely no tolerance for young children. (She could have told us kids are not welcome and we would look elsewhere). She told me that I have to control the baby so he will not cry or make noises. He is not allowed to touch anything in the apartment such as the TV and the alarm clock on the bedside table. When my son walked around the apartment, she was watching his every move with disgust. And he touched the alarm clock, she yelled at him. He is an 18 month old toddler and of course would not take orders as such. And all this happened while my husband was getting the lugguage from the car. When we decided it would not work for us to stay there for 5 days, we told her we would move out the next day. She became hysterical and started screaming at us in German. All the rude things she said about us being Chinese and about our baby (thinking that we cannot understand her German) She said we had to leave the apartment immediately. Even though we put in a deposit of 30% of the whole charge, we thought it was not worthwhile to argue with her and we started to pack up to leave. When my husband tried to help our baby get dressed again for the cold and raining weather outside, Mrs Hubmann told my husband to get the baby off the bed. My husband said he will as soon as he helped the baby wear his pants. Mrs Hubmann became hysterical again and grabbed my baby's leg and pulled him off the bed! Our baby was so scared he has never been roughed by someone like that. All that happened within 30 minutes in the apartment. We ended up checking in the Hilton where we know for sure we will have some peace. It is unfortunate that the first Muenchener I have ever met is like that, totally racist and unfriendly. PS: I wrote an email to [email protected] to tell them ybout your concerns. Ill remove Prague, thats definitly to far away for a Munich get out section. Just think about how much else should be added if such a distance is ok Vienna, Bern, Stuttgart, Bratislava, Frankfurt, Venice, Milano...... just to name the bigger cities. I guess the reason is that those places are less know. Why don't you add them. Especially Regensburg and Ausburg are treasures and can be reached quickly by car or train from Munich. If there are no objections I would start to draw the maps in the next days. Please let me know. Andechs Monastery— If you miss the Oktoberfest, it is worth travelling to the holy mountain of Andechs. It's a monastery up a hill from the Ammersee. Take the S8 from Munich to Herrsching and then either hike up the hill or take the bus. 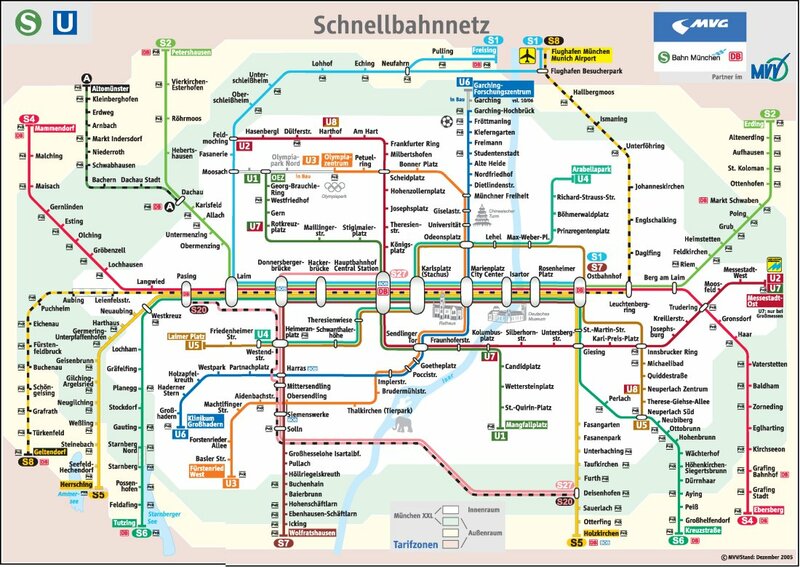 I was doing some research for my upcoming trip - they are listing the S8 but this source: http://www.toytowngermany.com/munich/munich_ubahn_plan.jpg (an ubahn map) shows it is the S5. "If you want to get to know the real Munich then don't miss to visit the Donisl which is on the Marienplatz. It's not as famous as the Hofbräuhaus but it's a real insider tip." Donisl is known in Munich as a tourist trap. The insider tip would be not to go there! have a look at http://www.allgaeu-airport.de/ in the meantime, which has most necessary information (though scattered…). The Munich public transportation map in this article is outdated. The S-Bahn lines have been renumbered and changed. If someone refers to this map, he or she is likely to end up at a completely wrong destination. Hence, I'd recommend to remove it. I agree on the Lehel matter and on the separation of Maxvorstadt and Schwabing (it was a hassle to deal with the combination of those two anyway - I just kept it because it was already set up like that). But what to do with Englischer Garten then? I would prefer not to split it up but to add it to Schwabing in its entirety (although the southern part is adjacent to Maxvorstadt and actually is part of Lehel). Splitting up Englischer Garten makes no sense from a travellers point of view in my oppinion. Also, I would suggest to subsume under "Haidhausen" everything that is located south of 'Prinzregentenstraße' and west of 'Ampfing-/Melusinen-/Claudius-Keller-/Werinherstraße' (i.e. Au-Haidhausen, Untergießing, parts of Obergiesing, parts of Ramersdorf, parts of Berg am Laim) for simplicity, and all the rest that is located on the right side of Isar under "East" - any thoughts on that?